In not sure whether I’ve been influenced by the recent buzz about Matt’s new book, On a Stick! 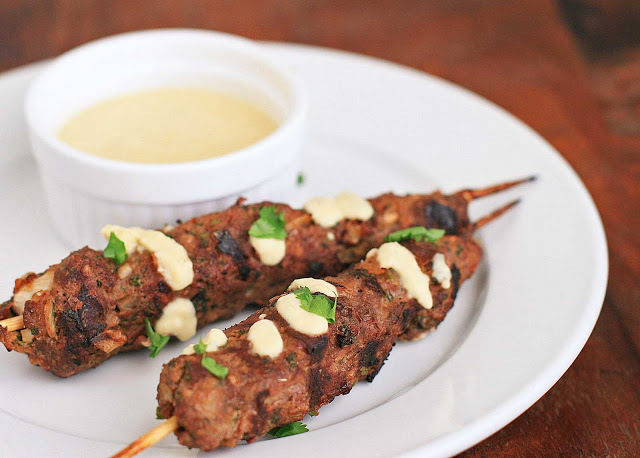 , or whether it’s just because food on a stick is generally awesome, but I’ve got a couple food on a stick recipes for you this week. First up are these spicy beef skewers. They’re a simple way to turn your average package of ground beef into something a little out of the ordinary. They’re also a good way to go global without having to hunt down a lot of exotic ingredients. I’ll confess that I spent the better part of yesterday trying to hunt down a rather obscure spice that isn’t widely available and I didn’t have much luck finding a source with reasonable shipping… sigh. But these beef skewers call for ingredients that should be widely available at pretty much any grocery store. These skewers are also pretty versatile: as an appetizer with the dipping sauce, an entrée with a grain and grilled vegetable, or in a pita with the hummus sauce and some chopped cucumber and tomato. All good options. Combine the beef with the onion, cumin, ground coriander, paprika, cayenne, salt, and cilantro and knead well. Place in a food processor and process until smooth. Place in a bowl, cover and refrigerate for at least an hour. Combine the chickpeas, olive oil, lemon juice, garlic, cumin seeds, tahini and greek yogurt in a food processor and process until smooth, adding a little water if necessary. Then gradually add water to your desired dipping consistency. Divide the meat into six portions of equal size. Thread the beef onto the soaked skewers. Heat your grill to high and cook the kebobs on each side for approximately 3-5 minutes on each side. Serve immediately with the chickpea sauce.